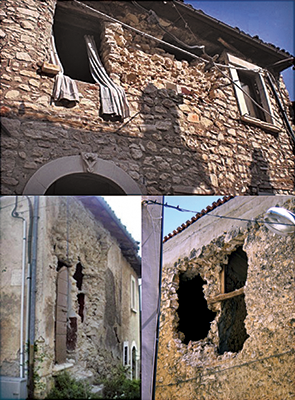 The present research proposes to test the dynamic behaviour of three–leaf masonry walls (two external leaves made of irregular stones poorly or not connected in the transversal direction separated by loose material infill in the centre) representative of a construction technique found throughout the seismic–prone Mediterranean countries. The proposed tests will also investigate the effects that the vertical component of the ground motion may have on the walls’ behaviour. 4) The effectiveness of strengthening techniques that include: a) grout injections carried out with a compatible mortar; b) addition of reinforcing devices (either steel rods or bundled steel fibers) to connect the outer stone leaves of the three-leaf walls; c) enhancement of the connections with the orthogonal wall for T walls using steel rods. The considered specimens will be built so as to reproduce a typical configuration used for three-leaf masonry walls throughout old Italian historic centers. Similar configurations are found in other Mediterranean and non-European seismic-prone countries.